Download "1.7.0 Floodplain Modification Criteria"
1 1.7.0 Floodplain Modification Criteria Introduction These guidelines set out standards for evaluating and processing proposed modifications of the 100- year floodplain with the following objectives: preserving the natural and traditional character of the land and waterway; encouraging sound engineering and ecological practices; preventing and reducing degradation of water quality; encouraging the stability and integrity of floodplains and waterways; and restoring floodplain health to support natural functions and processes. The guidelines apply to development proposed within the 100-year floodplain, both inside and outside of the Critical Water Quality Zone. Whenever a modification to a floodplain is proposed, a request for approval shall be submitted in conjunction with an application for a development permit. Such permit applications shall be reviewed in accordance with the provisions of these guidelines and all applicable ordinances, including sections (Floodplain Modification) and (Critical Water Quality Zone Development) of the Land Development Code. Note: These guidelines address the environmental aspects of floodplain modification. Separate drainage requirements (e.g., no adverse flooding impact) can be found in Chapter 25-7 (Drainage) and the Drainage Criteria Manual. Naturally functioning streams with connected floodplains dissipate stream energy, reduce soil erosion, reduce flood damage, capture and treat pollutants, and promote sustainable healthy ecosystems. Periodic flood flows that overtop the banks of stream areas are essential to the health of riparian corridors. The seasonal variability of flow and intermittent extreme events combine to shape the physical structure and biological diversity of floodprone areas. Healthy riparian zones filter pollutants from surface runoff and increase the baseflow of our waterways, thus improving water quality. Also, by providing shading and moderating water temperature, natural floodplains increase biodiversity and promote healthy riparian and aquatic habitats, improving water quality and the overall health of creeks Code Requirements A. Critical Water Quality Zone The Critical Water Quality Zone is a stream setback established by section (Critical Water Quality Zones Established) of the Land Development Code. The geometry of the setback can vary with the size of the drainage area and the watershed classification (e.g., Suburban). A Critical Water Quality Zone does not apply to a previously modified drainage feature located within a public roadway right of way that does not possess any natural and traditional character and cannot be reasonably restored to a natural condition. As a Critical Water Quality Zone would not be applied, the requirements outlined in this section do not apply to a drainage feature determined to meet these conditions. 2 Within Suburban watersheds, buffer averaging can be used to reduce the width of the setback in certain places as long as the overall area of the buffer provided is the same or greater. The requirements outlined in this section apply to the Critical Water Quality Zone delineated after buffer averaging is applied. 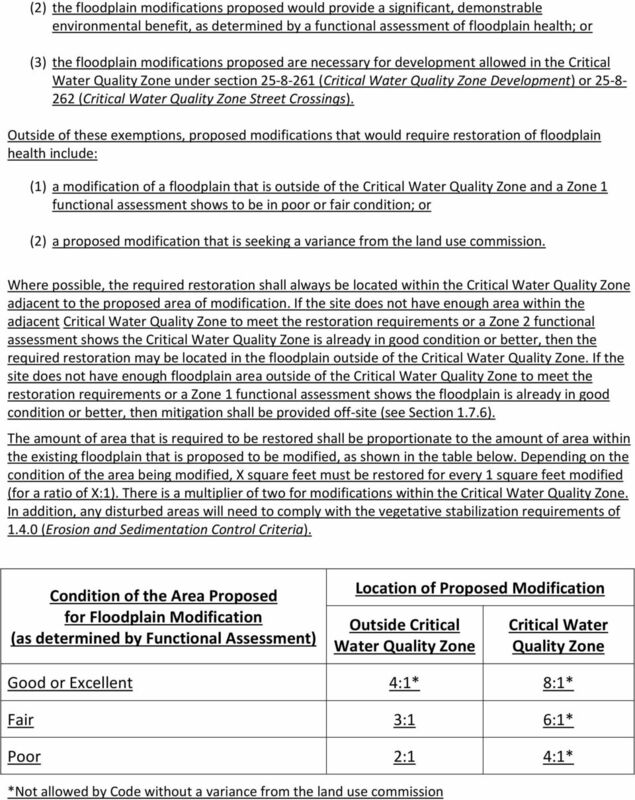 Floodplain modifications are prohibited in the Critical Water Quality Zone unless: (1) the floodplain modifications proposed are necessary to protect the public health and safety; (2) the floodplain modifications proposed would provide a significant, demonstrable environmental benefit, as determined by a functional assessment of floodplain health; or (3) the floodplain modifications proposed are necessary for development allowed in the Critical Water Quality Zone under section (Critical Water Quality Zone Development) or (Critical Water Quality Zone Street Crossings). If the proposed modification does not qualify for one of the three exemptions listed above in accordance with Section (Exemptions), then the applicant must seek a variance from the land use commission. B. Outside of the Critical Water Quality Zone In some areas, especially in the flatter topography of the eastern watersheds, the width of the 100-year floodplain can extend beyond the Critical Water Quality Zone (see figure). 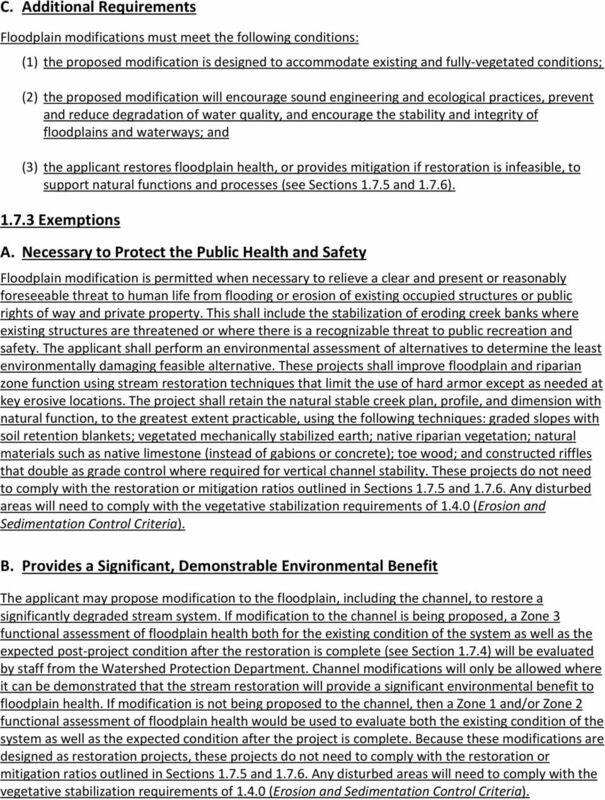 Floodplain modification is permitted outside of the Critical Water Quality Zone if: (1) the floodplain modifications proposed are necessary to protect the public health and safety; (2) the floodplain modifications proposed would provide a significant, demonstrable environmental benefit, as determined by a functional assessment of floodplain health; (3) the floodplain modifications proposed are necessary for development allowed in the Critical Water Quality Zone under section (Critical Water Quality Zone Development) or (Critical Water Quality Zone Street Crossings); or (4) the proposed modification is located in an area determined to be in poor or fair condition by a functional assessment of floodplain health (see Section 1.7.4). 3 C. Additional Requirements Floodplain modifications must meet the following conditions: (1) the proposed modification is designed to accommodate existing and fully-vegetated conditions; (2) the proposed modification will encourage sound engineering and ecological practices, prevent and reduce degradation of water quality, and encourage the stability and integrity of floodplains and waterways; and (3) the applicant restores floodplain health, or provides mitigation if restoration is infeasible, to support natural functions and processes (see Sections and 1.7.6) Exemptions A. Necessary to Protect the Public Health and Safety Floodplain modification is permitted when necessary to relieve a clear and present or reasonably foreseeable threat to human life from flooding or erosion of existing occupied structures or public rights of way and private property. This shall include the stabilization of eroding creek banks where existing structures are threatened or where there is a recognizable threat to public recreation and safety. The applicant shall perform an environmental assessment of alternatives to determine the least environmentally damaging feasible alternative. These projects shall improve floodplain and riparian zone function using stream restoration techniques that limit the use of hard armor except as needed at key erosive locations. The project shall retain the natural stable creek plan, profile, and dimension with natural function, to the greatest extent practicable, using the following techniques: graded slopes with soil retention blankets; vegetated mechanically stabilized earth; native riparian vegetation; natural materials such as native limestone (instead of gabions or concrete); toe wood; and constructed riffles that double as grade control where required for vertical channel stability. These projects do not need to comply with the restoration or mitigation ratios outlined in Sections and Any disturbed areas will need to comply with the vegetative stabilization requirements of (Erosion and Sedimentation Control Criteria). B. Provides a Significant, Demonstrable Environmental Benefit The applicant may propose modification to the floodplain, including the channel, to restore a significantly degraded stream system. 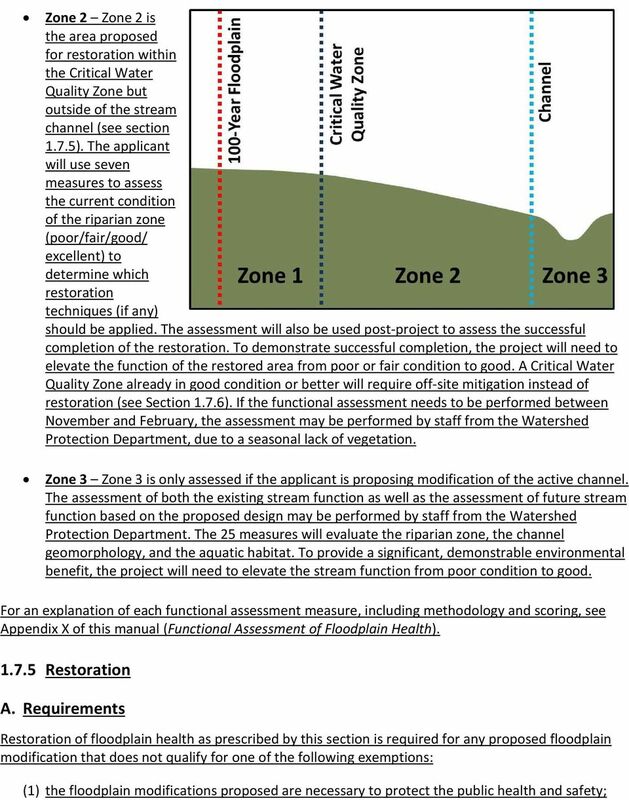 If modification to the channel is being proposed, a Zone 3 functional assessment of floodplain health both for the existing condition of the system as well as the expected post-project condition after the restoration is complete (see Section 1.7.4) will be evaluated by staff from the Watershed Protection Department. Channel modifications will only be allowed where it can be demonstrated that the stream restoration will provide a significant environmental benefit to floodplain health. 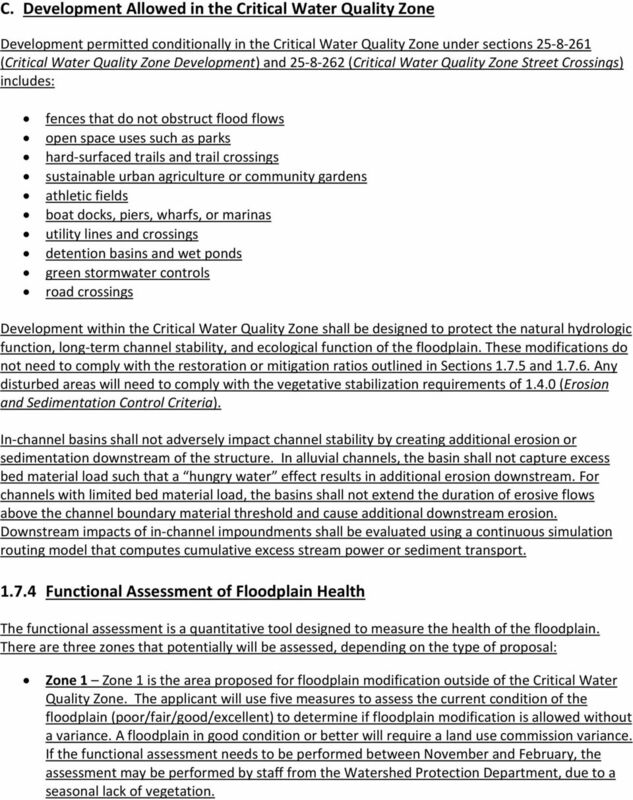 If modification is not being proposed to the channel, then a Zone 1 and/or Zone 2 functional assessment of floodplain health would be used to evaluate both the existing condition of the system as well as the expected condition after the project is complete. Because these modifications are designed as restoration projects, these projects do not need to comply with the restoration or mitigation ratios outlined in Sections and Any disturbed areas will need to comply with the vegetative stabilization requirements of (Erosion and Sedimentation Control Criteria). 4 C. Development Allowed in the Critical Water Quality Zone Development permitted conditionally in the Critical Water Quality Zone under sections (Critical Water Quality Zone Development) and (Critical Water Quality Zone Street Crossings) includes: fences that do not obstruct flood flows open space uses such as parks hard-surfaced trails and trail crossings sustainable urban agriculture or community gardens athletic fields boat docks, piers, wharfs, or marinas utility lines and crossings detention basins and wet ponds green stormwater controls road crossings Development within the Critical Water Quality Zone shall be designed to protect the natural hydrologic function, long-term channel stability, and ecological function of the floodplain. These modifications do not need to comply with the restoration or mitigation ratios outlined in Sections and Any disturbed areas will need to comply with the vegetative stabilization requirements of (Erosion and Sedimentation Control Criteria). In-channel basins shall not adversely impact channel stability by creating additional erosion or sedimentation downstream of the structure. In alluvial channels, the basin shall not capture excess bed material load such that a hungry water effect results in additional erosion downstream. For channels with limited bed material load, the basins shall not extend the duration of erosive flows above the channel boundary material threshold and cause additional downstream erosion. Downstream impacts of in-channel impoundments shall be evaluated using a continuous simulation routing model that computes cumulative excess stream power or sediment transport Functional Assessment of Floodplain Health The functional assessment is a quantitative tool designed to measure the health of the floodplain. 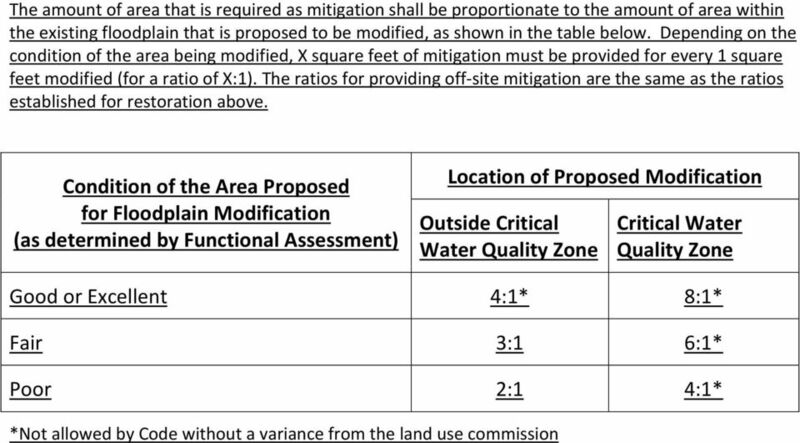 There are three zones that potentially will be assessed, depending on the type of proposal: Zone 1 Zone 1 is the area proposed for floodplain modification outside of the Critical Water Quality Zone. The applicant will use five measures to assess the current condition of the floodplain (poor/fair/good/excellent) to determine if floodplain modification is allowed without a variance. A floodplain in good condition or better will require a land use commission variance. If the functional assessment needs to be performed between November and February, the assessment may be performed by staff from the Watershed Protection Department, due to a seasonal lack of vegetation. 7 The applicant shall prepare and submit a Riparian Restoration Plan to be reviewed and approved by the Watershed Protection Department as part of the Site Development Permit. 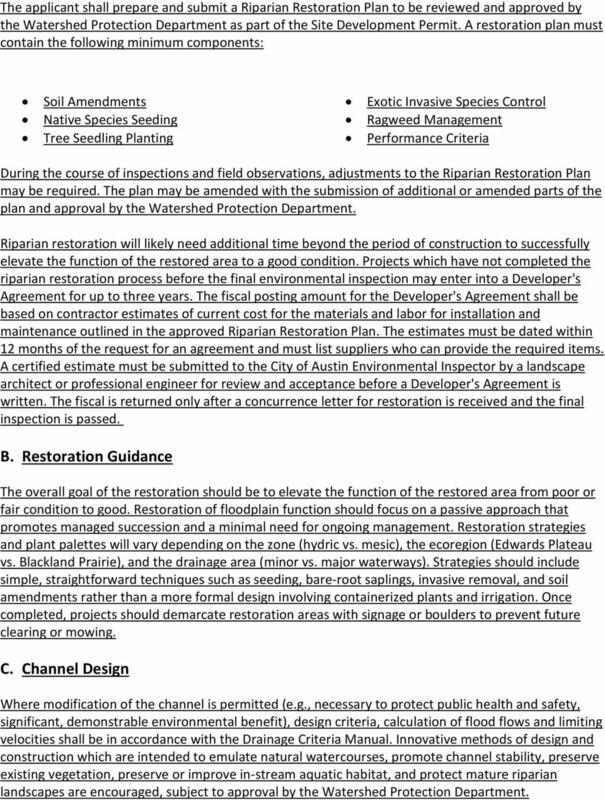 A restoration plan must contain the following minimum components: Soil Amendments Native Species Seeding Tree Seedling Planting Exotic Invasive Species Control Ragweed Management Performance Criteria During the course of inspections and field observations, adjustments to the Riparian Restoration Plan may be required. The plan may be amended with the submission of additional or amended parts of the plan and approval by the Watershed Protection Department. Riparian restoration will likely need additional time beyond the period of construction to successfully elevate the function of the restored area to a good condition. Projects which have not completed the riparian restoration process before the final environmental inspection may enter into a Developer's Agreement for up to three years. The fiscal posting amount for the Developer's Agreement shall be based on contractor estimates of current cost for the materials and labor for installation and maintenance outlined in the approved Riparian Restoration Plan. The estimates must be dated within 12 months of the request for an agreement and must list suppliers who can provide the required items. A certified estimate must be submitted to the City of Austin Environmental Inspector by a landscape architect or professional engineer for review and acceptance before a Developer's Agreement is written. The fiscal is returned only after a concurrence letter for restoration is received and the final inspection is passed. B. Restoration Guidance The overall goal of the restoration should be to elevate the function of the restored area from poor or fair condition to good. Restoration of floodplain function should focus on a passive approach that promotes managed succession and a minimal need for ongoing management. Restoration strategies and plant palettes will vary depending on the zone (hydric vs. mesic), the ecoregion (Edwards Plateau vs. Blackland Prairie), and the drainage area (minor vs. major waterways). Strategies should include simple, straightforward techniques such as seeding, bare-root saplings, invasive removal, and soil amendments rather than a more formal design involving containerized plants and irrigation. Once completed, projects should demarcate restoration areas with signage or boulders to prevent future clearing or mowing. C. Channel Design Where modification of the channel is permitted (e.g., necessary to protect public health and safety, significant, demonstrable environmental benefit), design criteria, calculation of flood flows and limiting velocities shall be in accordance with the Drainage Criteria Manual. Innovative methods of design and construction which are intended to emulate natural watercourses, promote channel stability, preserve existing vegetation, preserve or improve in-stream aquatic habitat, and protect mature riparian landscapes are encouraged, subject to approval by the Watershed Protection Department. 8 1.7.6 Mitigation A. 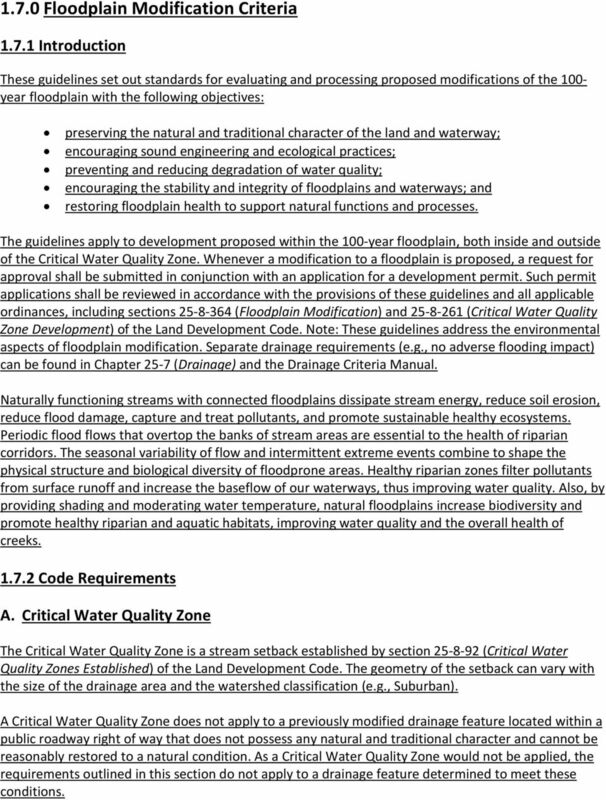 Requirements Where possible, the required restoration shall always be located within the Critical Water Quality Zone adjacent to the proposed area of modification (see Section 1.7.5). 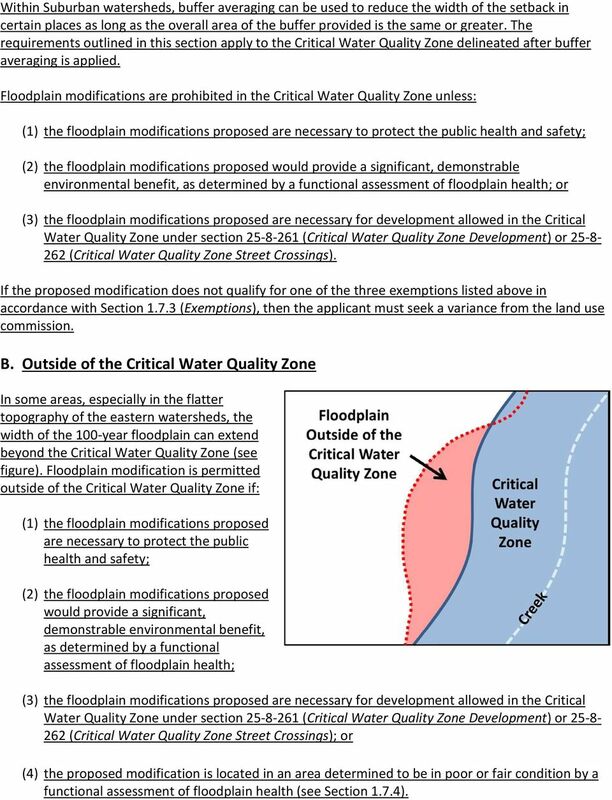 If the site does not have enough area within the adjacent Critical Water Quality Zone to meet the restoration requirements or a Zone 2 functional assessment shows the Critical Water Quality Zone is already in good condition or better, then the required restoration may be located in the floodplain outside of the Critical Water Quality Zone. If the site does not have enough floodplain area outside of the Critical Water Quality Zone to meet the restoration requirements or a Zone 1 functional assessment shows the floodplain is already in good condition or better, then mitigation shall be provided off-site. Mitigation must be located within the same watershed classification and shall consist of: (1) paying into the Riparian Zone Mitigation Fund a non- refundable amount established by ordinance; (2) dedicating land to the City or another entity approved by the Watershed Protection Department director in fee simple and which the City or other entity accepts; or (3) placing restrictions on land to the benefit of the City or another entity approved by the Watershed Protection Department director and which the City or other entity accepts. If land is dedicated or restricted, it must be approved by the City and the applicant must file in the deed records a restrictive covenant, approved by the city attorney, that runs with the transferring tract and describes the restrictions on development and vegetation management. 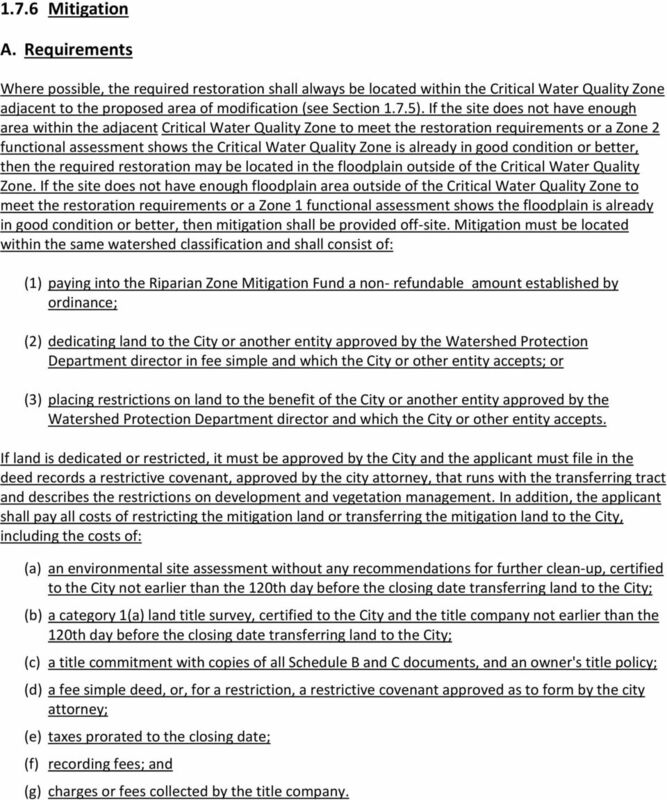 In addition, the applicant shall pay all costs of restricting the mitigation land or transferring the mitigation land to the City, including the costs of: (a) an environmental site assessment without any recommendations for further clean-up, certified to the City not earlier than the 120th day before the closing date transferring land to the City; (b) a category 1(a) land title survey, certified to the City and the title company not earlier than the 120th day before the closing date transferring land to the City; (c) a title commitment with copies of all Schedule B and C documents, and an owner's title policy; (d) a fee simple deed, or, for a restriction, a restrictive covenant approved as to form by the city attorney; (e) taxes prorated to the closing date; (f) recording fees; and (g) charges or fees collected by the title company. Attachment 9 San Diego Integrated Regional Water Management Economic Analysis Flood Damage Reduction Costs and Benefits Attachment 9 consists of the following items: Flood Damage Reduction Costs and Benefits. Chapter 306 Soil Erosion, Sedimentation, and Pollution Control Section 306-1 Exemptions This chapter shall not apply to any of the following activities: (A) Surface mining, as the same is defined in O.C.G.A.